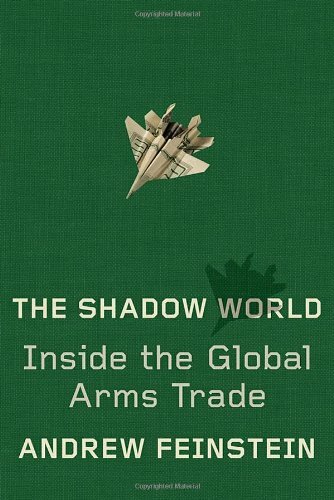 Andrew Feinstein’s The Shadow World is aptly named because it describes in intimate detail the world of arms suppliers and other miscreants who interface with the arms trade throughout the world, both inside and outside of governmental circles. How does this book further the discussion of this important topic? First, Mr. Feinstein has done all of us who follow current affairs closely a great service in bringing to the light of day how the major governments of the world spend a lot of their time and treasure in promoting the sale of weapons, and by noting the class of people whom they interact with in promoting this strategy. Second, Mr. Feinstein’s detailed observations are further illustrative because many of us not only don’t understand the mentality of arm’s dealers, but also don’t fathom the psyche and motivation of an individual such as Viktor Bout, recently in the news, who would literally provide armaments and weaponry to both sides of a conflict regardless of personal ideology. Fourth, The Shadow World encourages the reader of current affairs to ask the following questions: What is it that motivates an arms trader? Why do they so often cast aside their personal ideologies, countries of origins, and religious affiliations to, as it were, trade with the enemy. Extremely interesting sections cover the relationship and deft political strategies displayed Prince Bandar of Saudi Arabia involving various NATO governments, including the United States. On the other hand, an issue that takes away from the strength of The Shadow World is that at a certain point, Mr. Feinstein’s style and the examples he uses to support his contentions become repetitive. For instance, the endless discussion of the BAE arms scandal in the United Kingdom, after it had thoroughly explored in the earlier parts of this book, was unnecessary. As such, certain sections of this work added little to the literature and the body of knowledge relating to the clandestine world of arms dealers. Otherwise a worthwhile read. Dr. Mark Kass is the author of Intercultural Cooperation Between Israelis and Palestinians: A Guide to Conflict Resolution Facilitation.